SEATTLE--(BUSINESS WIRE)--Jul. 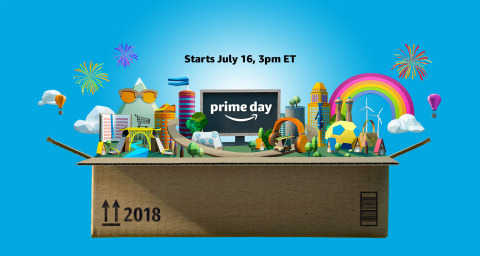 3, 2018-- (NASDAQ:AMZN) – Amazon’s highly anticipated annual shopping event, Prime Day will start on July 16 at 12pm PT/3pm ET and will run through July 17. Bigger than ever, Prime Day (and a half) will extend from 30 hours in 2017 to 36 hours, with more than one million deals exclusively for Prime members around the world, plus select deals at all U.S. Whole Foods Market stores. Members in the U.S., U.K., Spain, Mexico, Japan, India, Italy, Germany, France, China, Canada, Belgium, Austria and – new this year – Australia, Singapore, Netherlands and Luxembourg, can shop deals across TVs, smart home, kitchen, grocery, toys, fashion, furniture, appliances and back-to-school supplies and even stock up on everyday essentials. This year, Prime Day will feature double the deals on Amazon devices—and the biggest deals yet on Alexa-enabled products like Echo, Fire TV and Fire tablets, in addition to new categories from home security to Echo devices with screens. Not a member yet? Anyone can join Prime or start a 30-day free trial at amazon.com/primeday to participate in Prime Day.